• Will this "shutdown" thing start happen to other DVD rippers AnyDVD alternative software? Firstly, AnyDVD software still works even it's down at present or maybe forever. Ripping DVD or Blu-ray or CD with AnyDVD HD licensed copy won't be inaccessible. However, we still advocate finding a best AnyDVD or AnyDVD HD alternative DVD backup software, due to the never-ending updated DVD copy protection technology. As to the third question, we really cannot be sure. Most of you have been aware of the convenience to extract DVD video contents for playing on portable devices like smartphone and pads on the go, or watching DVDs at home on widescreen UHD TV sets via a server (NAS), streaming, etc without inserting physical discs. But technically, ripping commercial movie DVD is forbidden in some areas with strict DVD copyright laws, while advocated only for personal use in others. * Supports all DVD encryptions, including Disney X-project DRM, CSS, region code, RCE, Sony ArccOS, UOPs. 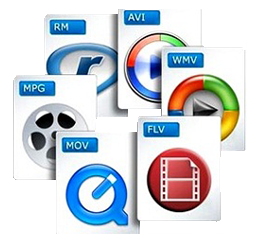 * Continuously updated to rip newest protectd DVDs to 350+ formats/devices like MP4, AVI, iOS, Android, etc. * 1:1 backup copy protected DVDs to DVD ISO, DVD folder and MPEG2 file (3 steps only). "What's wrong with SlySoft AnyDVD? What is other AnyDVD HD alternative good software for removing the copyrights of DVDs?" What AnyDVD HD serves up can be summed up pretty simply: save DVD collection onto external hard drives for watching in multiple ways. There are so many DVD rippers that can reach the very basic standard. But speaking of removing sorts of DVD encryptions, you really need a best AnyDVD HD alternative. By that we mean WinX DVD Ripper Platinum, which keeps updating to rip any new copy protected DVD movies, even Disney DVD Frozen, Inside Out or Zootopia. "WinX DVD Ripper Platinum does a very good job backing up and transcoding your DVD collection, including your copy-protected discs. It worked flawlessly in my tests." Above is the comment of this AnyDVD HD alternative software from PCWorld editor Jon L. Jacob. The crux of the SlySoft down matter is that AnyDVD HD will have no updates to support new DVD copy protections from now on, which happens to be what WinX DVD Ripper Platinum is good at. 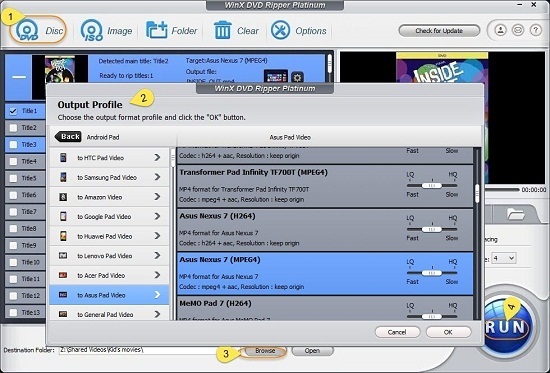 Get this alternative DVD Ripper software to AnyDVD HD installed on your Windows (10) or Mac, and you will be easily able to bypass DVD CSS, region code, RCE, Sony ArccOS, UOPs, Disney X-project DRM, etc and backup DVD movies to 350+ video/audio formats and devices built in it. By the way, the whole DVD ripping process would be done in only 3 steps within minutes, thanks to its flexible CPU use setting and Hyper-threading tech. Insert your physical DVD disc into the drive, open the AnyDVD HD Alternative software, click "DVD Disc" button and load the DVD video. Normally, the main title of encrypted DVD movies will be auto selected. In this part, you are allowed to rip protected DVD to MP4, AVI, MOV, PC, Mac, iPhone, iPad, Android, etc. Just find what you need in the "Output Profile" center. 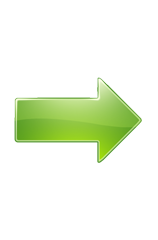 Choose a destination folder and press "RUN" to begin DVD backup with this AnyDVD HD Alternative. Try "Safe Mode", just in case you are ripping a strictly protected DVD. WinX DVD Copy Pro is actually a DVD burner software for Windows (10) platform. With this AnyDVD alternative, you can freely copy movie DVD to DVD, DVD to VIDEO_TS Folder, DVD to ISO, DVD to MPEG2 file etc. Built in with ISO mounter, you will be able to mount ISO to a virtual drive as well. Besides, it faultlessly supports Disney's Fake, severely scratched DVDs and Sony ARccOS bad sector.